Blown-in fibreglass insulation retains R-value without settling. Blown-in fibreglass insulation is resistant to moisture absorption. Blown-in fibreglass insulation will not corrode pipes or wires. Blown-in fibreglass insulation is naturally non-combustible. Blown-in fibreglass insulation does not contain formaldehyde. R-value is a measure of thermal resistance used in the building and construction trades. It refers to the amount of heat flow through a given thickness of material. To put it simply, the higher the R-value, the greater the insulating power. Does your home have sufficient insulation in the attic for energy efficiency? 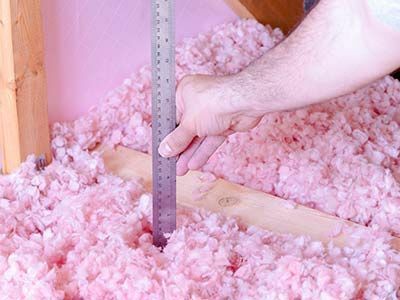 In order to achieve the R-values that are recommended for your Saskatchewan home, attic insulation should be at least 14” to 16” inches deep, depending on the type of insulation used. For more information about home insulation materials and costs, or to book a free estimate on installation, please contact our office. We accept calls Monday through Saturday from 8:00 a.m. to 10:00 p.m.